IN ORDER TO BID ON THIS PROPERTY YOU MUST FILL OUT THE NECESSARY FORMS ATTACHED IN THE PROPERTY BROCHURE. IT IS UNDERSTOOD THAT NO ONE WILL BE PERMITTED TO BID ON THIS PROPERTY UNLESS THEY HAVE FILLED OUT THE NECESSARY FORMS AND SUBMIT IT TO THE BROKER PRIOR TO FINAL DUE DATE OF APRIL 16TH 2014 BY 5:00PM EST. 3. SUBMIT FORMS ON OR BEFORE APRIL 16TH 2014 BY 5:00PM EST. 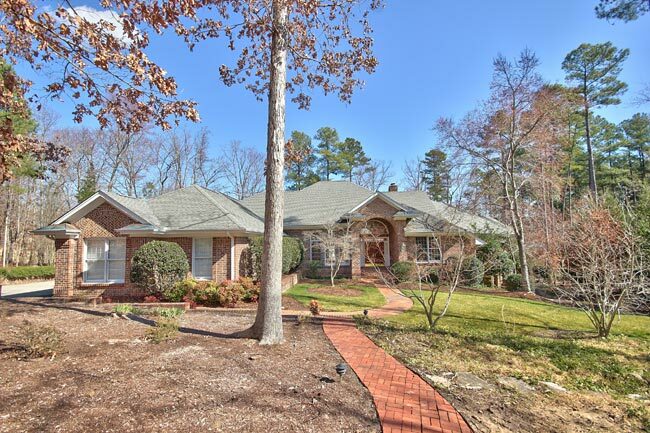 Welcome to the Governors Club, this beautifully maintained estate has over 5,000 total square feet with 4 bedrooms, 4 baths and perfect for formal entertaining with a large great room and formal dining room. Situated on the eighth hole of the foothills golf course with multiple views, enjoy the privilege of this beautiful gated community with privacy, comfort and security. The Governors Club is a gated golf community located in Chapel Hill, North Carolina. Governors Club consists of over 1,200 home sites on 1,600 acres of rolling, wooded land. The beautifully landscaped streets of Governors Club are lined with unique custom homes for sale ranging from 3,500 to 10,000+ square feet, and from the $300’s to over $3 million in price. The area around Governors Club is an international center for major computer, pharmaceutical, health and other companies, as well as home to nationally renowned universities and research driven medical facilities. Within the past decade, the Triangle has been named the #3 Top Overall Metro, #3 Best City for Entrepreneurs, #6 Best City for Singles, #4 Best Place to Live, and the #2 Best Place for Business and Careers by publications such as Forbes, Money, and Expansion Management. If you are considering the move to North Carolina, Chapel Hill is truly a vibrant area of the state, and a wonderful place to live and work. In addition, the Governors Club Community includes Governors Club, Inc., a private club which boasts a 27 hole Jack Nicklaus Chapel Hill golf course as well as a wellness, swim and tennis center and a 42,000 sf Clubhouse. Governors Club offers many social and recreational amenities to its members. Governors Club is the premiere golf course community and the premiere private gated community in the Chapel Hill area of the Triangle. If you are looking for great golf in Chapel Hill, look no further than Governors Club. This property will be sold and marketed in conjunction with: Ginny Berg (Coldwell Banker-Howard Perry and Walston) an authorized agent of the Public Pricing® sales system.